Applicants are ranked in order of who would be a high performer within your organization prior to conducting an interview or even reviewing a résumé. The most important aspect of identifying job applicants is selecting those high performers for hire. The Ingelix™ hiring solution has processed over 5 million individuals through 100,000 combinations of industry variables. Applicants are ranked in order of who would be a high performer within your organization prior to conducting an interview or even reviewing a résumé. The Ingelix™ Hiring Solution then captures those individuals who were hired and entered the workplace environment alongside those who were rejected. Figure 1. A view of the Ingelix™ Dashboard. A test’s level of effectiveness is directly related to its validity (the degree to which the test measures what it is supposed to measure) and its reliability (how consistent the test is at measuring what it is supposed to measure). The Ingelix™ scales have undergone significant research across various job categories utilizing several validation strategies. The results of all the research conclude that the tests are valid predictors of critical aspects of job performance. The three validation methods used to establish the validity of the HRTL are summarized below. The concurrent, criterion-related validation method requires that the test be administered to current employees. Performance data is then gathered on those employees. If the test were a valid predictor of job performance, one would expect a statistically significant correlation between test scores and the performance data collected. In other words, those employees who score high on the test are the same employees who demonstrate high levels of performance. Those employees who do poorly on the test would likely be those who demonstrate poor performance. The correlations obtained throughout all of the criterion-related validity studies indicate that the Ingelix™ test methodology predictors of top level job performance. In addition to the concurrent validation strategy described above, construct validation studies have been performed for many of the Ingelix™ scales. This validation strategy attempts to demonstrate the degree to which the instrument in question actually measures the psychological construct it is intended to measure. This approach generally involves administering the test in question along with another well-researched and established instrument that measures the same construct. If the two instruments measure the same construct, one would expect to find a significant correlation between the two. From the construct validation studies reviewed we can conclude that the Ingelix™ scales measure the construct they were designed to measure and therefore are construct valid. 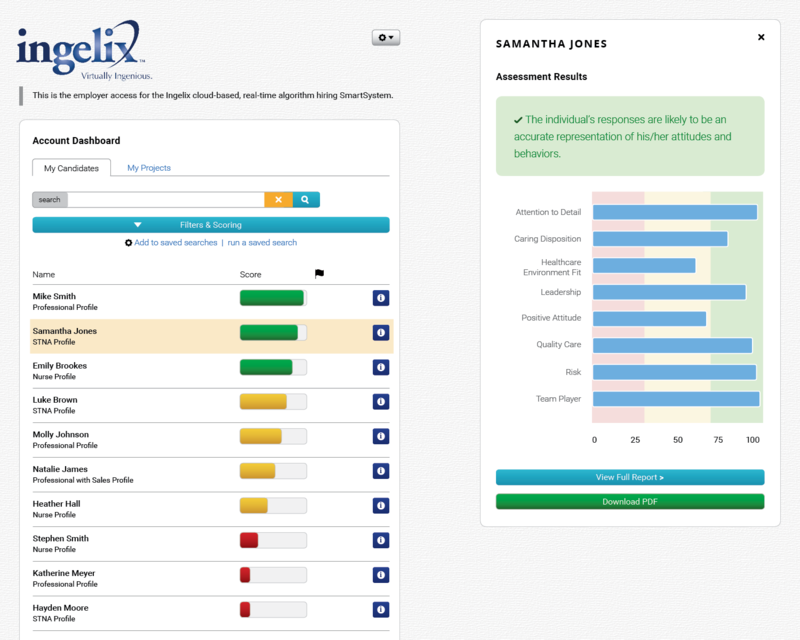 An additional strategy utilized to establish the validity of the Ingelix™ scales was to compare test scores to anonymous self-reports. Some tests measure behaviors that are not always observable yet could have a serious negative impact to your organization; for example stealing or illegal drug use. The anonymous self-report validation strategy makes it possible to collect past behavior information (e.g., stealing history, illegal drug use frequency) in a non-threatening manner. Test scores are then compared to the self-report ratings to determine the tests ability to identify those counterproductive behaviors. The results of the validation studies using the self-report data collection method offer strong support for the validity of the Ingelix™ scales intended to predict counterproductive workplace behaviors. In addition to the validity studies described above, reliability analyses have been performed for each Ingelix™ scale. Reliability refers to the degree to which the scale items are consistent in measuring the skill or construct the scale is intended to measure. These results do, in fact, show that the HRTL scale items are consistent in measuring what they are intended to measure.